Ships tomorrow if you order in the next 18 hours 13 minutes. 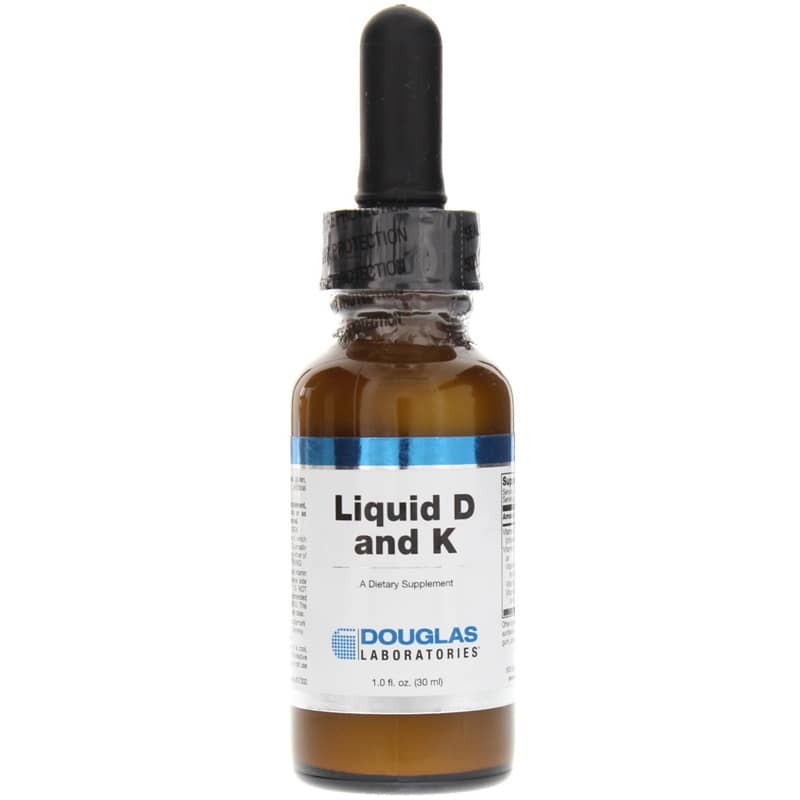 Liquid D and K, from Douglas Laboratories is a unique, great tasting liquid supplying significant amounts of vitamins K1 and K2 as well as vitamin D3 to support optimal bone health. A growing body of literature supports the concept that increased intake of vitamin K both from food as well as supplements can have a beneficial impact on supporting bone health*. While the term vitamin K may imply a single molecule, vitamin K is actually a group of similar molecular forms including K1 (phylloquinone) and K2 (menaquinone). Liquid D and K has been specially formulated to include the most important molecular forms of vitamin K for optimal health. Vitamin K has been shown to support decreasing calcium excretion and is involved in gamma-carboxylation of osteocalcin. Osteocalcin is important for healthy bone formation, as it facilitates the binding of calcium to hydroxyapatite (bone matrix). While Vitamin K1 has shown to be useful in some studies, vitamin K2 is thought to have additional, beneficial effects, as the body has a natural preference to accumulate this vitamin in tissues such as bone. MK-7, a natural form of vitamin K2, in particular has shown to have rapid bioavailability in the body and the low dosages required (45mcg) can be useful for supporting bone health*. Vitamin D is well known for the role it plays in helping to regulate calcium and bone metabolism. As we age, vitamin D status declines. If given the same amount of light, a younger person can produce more vitamin D compared with an older individual. When advancing age is combined with northern latitudes one can quickly become deficient in vitamin D.
Vitamin D can increase the expression of osteocalcin and other important compounds from osteoblasts to help support bone formation or it can help to breakdown bone and mobilize calcium when it is needed elsewhere in the body. Numerous scientists now feel that supplementation with vitamin D at levels greater than previously thought necessary may be critical to helping maintain healthy bone remodeling as we age*. Other Ingredients: Water, medium chain triglycerides, sunflower oil, cellulose, natural vanilla flavor, xanthan gum, potassium sorbate, and stevia. Contains NO: yeast, wheat gluten, milk/dairy, corn, sodium, sugar, starch, artificial coloring, preservatives, or flavoring. Adults: As a dietary supplement, adults take 1 dropper (1 ml) daily or as directed by your healthcare professional. This product contains vitamin K which interferes with the prescription drugs Coumadin and warfarin. Do not take this if taking either of these drugs. Keep out of the reach of children.